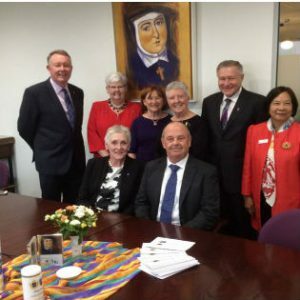 Janet Freeman, principal of Loreto Kirribilli from 1999 to 2013, has been commissioned as a new Trustee of Mary Aikenhead Ministries. Educated at St Mary’s School, Rydalmere, and Bethlehem College, Ashfield, Janet graduated with a BA Dip Ed from Macquarie University in 1976, was awarded her Masters in Education in 1986 and a Graduate Diploma of Religious Education in 1996. Janet has received an award for leadership from the Australia Council for Educational Leaders and the Principal’s Award for Excellence from the NSW Parents’ Council. Janet has worked in Catholic Education for more than 40 years, 25 of which were as Principal of Catholic schools; first, at Mercy College at Chatswood and then at Loreto, Kirribilli for 15 years. Amongst other appointments in her career, she has been on The National Executive of both The Association of Catholic School Principals and The Alliance of Girls Schools Australia, State Secretary and Treasurer for the ACT/NSW Branch of the Association of Heads of Independent Schools, a member of the Parramatta Diocesan Schools’ Council and the Broken Bay Diocesan Schools’ Board and for ten years was a member of the NSW Catholic Education Commission Education Policy Committee. Presently she is a member of the Loreto College Ballarat School Board, the fundraising committee for the John Berne School and the Marist Regional Education Council (NSW). Janet consults in education, particularly being involved in the selection and performance review of executive staff for independent and system schools. In 2017 Janet was a member of the Mary Aikenhead Australia Education Advisory Committee, a position she relinquished on appointment as a Trustee. Janet is continuing her work in Catholic education part-time with Sydney Catholic Schools, coordinating a mentor program which links disadvantaged students in systemic schools with successful business people. Find the liturgy for Janet’s commissioning here (1 Commissioning Janet Freeman Liturgy) , the comments Sr Clare made during the commissioning (2 Commissioning of Janet Freeman – 8 March 2017) here, and the words Sr Clare spoke to Janet and all the Trustees at the welcome dinner on that evening (3 MAM dinner final) here.